Writing inspiration can be fickle and fleeting, so we should grab it when it strikes. Right? I see a lot of screenwriters choose their next writing project based purely on a spark of interest. It might be a funny “what if” that forms the nugget of a story concept. Or a quirky real-life person who’s so clearly a great movie character. Inspiration strikes and the aspiring screenwriter dives right in. But considering how much time you’ll have to invest if you really want to get that project to the finish line, it’s worth being intentional in your choice of project, don’t you think? You could latch onto the next shiny ball that appears, but you have all those other ideas that have been on the back burner… How do you choose? What do you want your next screenplay to do for you? Depending on where you are in your screenwriting journey, what you hope to accomplish with your next project can vary quite a bit. What are some of the things you might want to accomplish? Are you still learning the basics of screenwriting? Choosing a story that centers around one main character attempting to accomplish one main objective will make the job of breaking and structuring the screenplay easier, and that means you’ll be more likely to finish. And the experience of taking a story from idea to completed screenplay will help you improve your grasp of the craft. Or maybe you’re honing your dialogue skills. Or you want to write something in a new genre. Whatever the specific goal, improving your screenwriting skills is a viable and worthy reason to write your next screenplay. Knowing that in advance means you can choose an idea that will help you achieve it. If you’ve reached a point where you’re ready to get some industry eyes on your screenwriting, you’ll probably want to choose a next project that benefits your portfolio and your professional appeal. Maybe you want to write something that will really solidify your brand as a writer. Or something that will show your range, if you’ve been feeling pigeonholed. Maybe you want to write something you can produce yourself on a super low budget. Or maybe you want to write something explicitly commercial or high concept. Maybe you want to write one of those based-on-real-life ideas that keep making the Black List every year. If you want your next project to fulfill a specific purpose for your career, it’s important to know where you’re aiming and then think about whether the projects you’re considering can meet those needs. 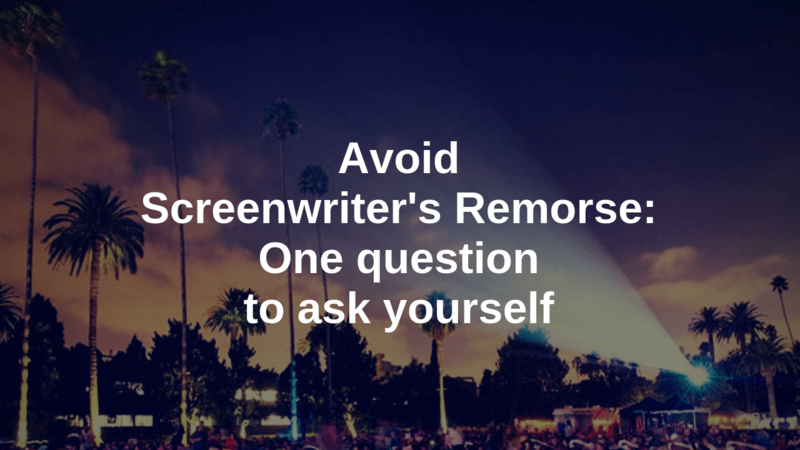 What if you don’t care about the craft or building a screenwriting career? That’s okay too. If you’re writing simply for the personal fulfillment, that makes your choice of next project infinitely easier. Just go where you feel the most interest, excitement, or passion. **So what do you do if inspiration strikes? Surely I’m not saying to ignore it, right? Just so you can go through a logical, thoughtful evaluation of whether or not you should write that idea that’s suddenly burning in your brain? Grab that inspiration and do a brain dump. Write down everything you love or that’s getting you all excited about that new project. Ideas for characters. For dialogue. For themes. How you see the big-picture shape and structure of the story. That awesome opening scene, or big climactic battle. Get it all down while the energy is high. Then, when cooler heads prevail, you can evaluate whether this should be your next project. Think about the next goal you want to achieve. Now think about whether the project(s) you’re considering diving into will get you there. Ultimately, being intentional about your choice of project and why you’re writing it will help you see the project through to the end, rather than jumping to the next interesting idea you come across (leaving a trail of half-finished scripts in your wake). And being clear about what you hope to get out of your next project will help ensure you’re not disappointed when you’re done.